User experience has become the paramount focus of parking garages. 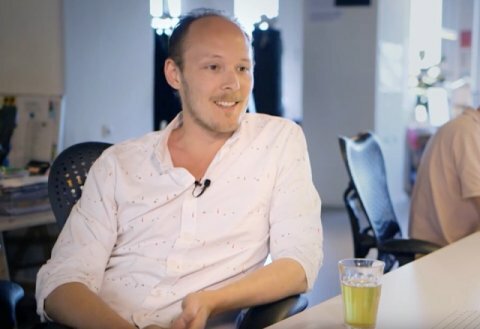 Whether it be a new construction or a renovation project, providing a safe, comfortable experience for the user has become the center of design. As many can relate, it’s not a pleasant experience being unable to find the the exit or the location of your vehicle. 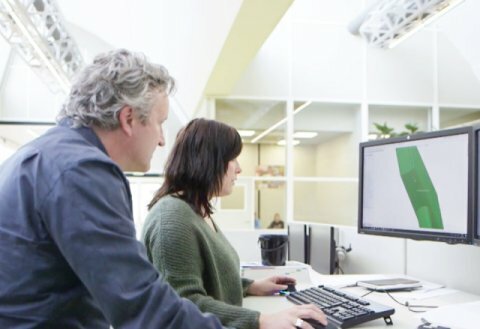 Thus, Bolidt takes pride in offering their expertise throughout the design process. 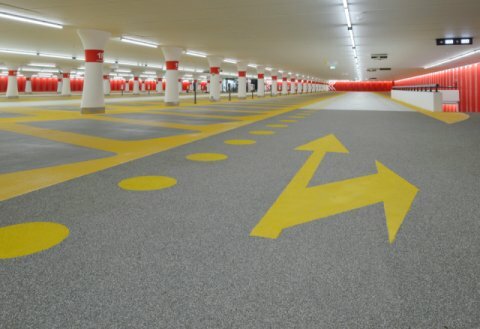 Wayfinding is perhaps the most fundamental feature in providing a safe environment for users of a parking facility. The symbols should be stark and vibrant, lasting a lifetime under the constant tread of tyres. Here are three projects where Bolidt’s unique advantages paved the way to a user-friendly parking garage. Schiphol P1 is a perfect example of wayfinding at its best. Each area coordinates with a Dutch symbol, adding an extra layer of association for the user to identify with. The symbols can be found in the parking area and the lift that leads to the parking. On top of this, clear distinctions are made between the different areas using light, fresh colours. All in all the project involved almost 15,000 square meters of anti-slip finish with the Boligrip® 300-R flooring system. 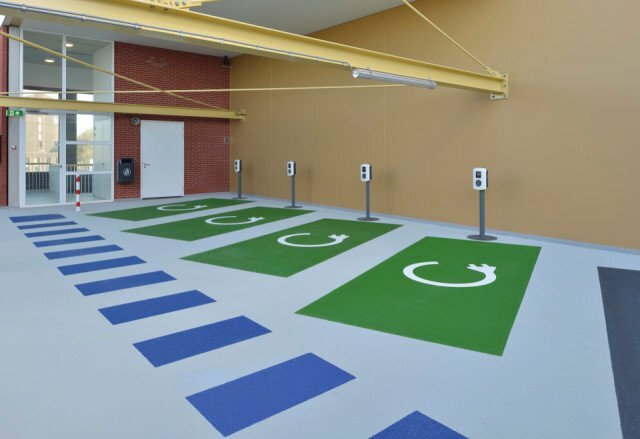 This system was especially developed for parking garages and is particularly resistant to loads of intensive traffic, which is essential as P1 is intended for short-term parking. The durability of the floor is important not only because of the extensive burden, but also for the sake of safety. 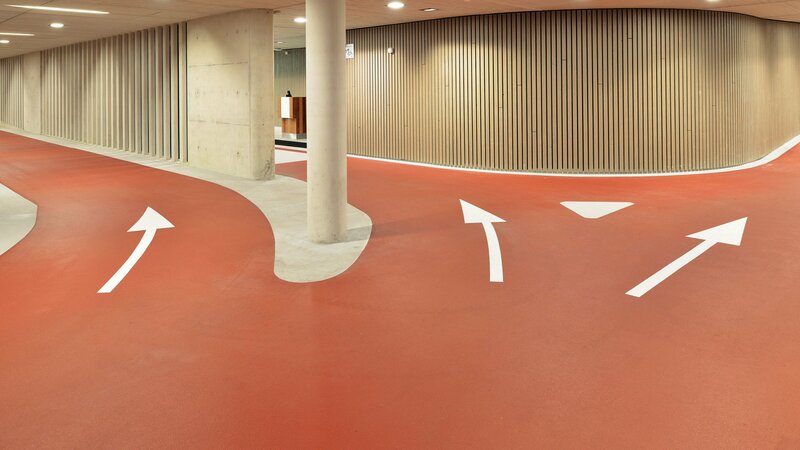 Due to the process of application, signage and symbols within Bolidt flooring cannot be marred or smeared over time. Rather than painting the designs on the surface, the symbols are ‘filled’ into the flooring from the ground up. Therefore, designs look fresh and unblemished decades after the initial application. Bike Park Hoog Catharijne is a project of epic proportions. 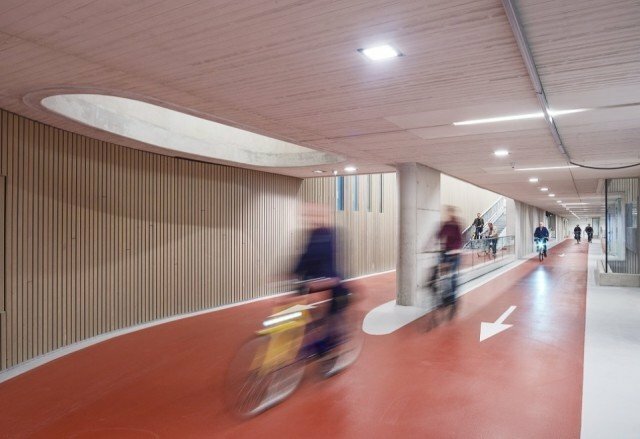 By the time it is completed, 22,000 people will have access to the world’s largest bicycle parking garage in Utrecht. 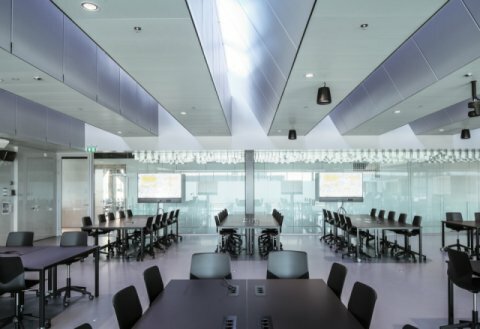 For such a monumental project as this, it’s only right that Netherlands-based Bolidt offer up their skills in making a safe, durable, and user-friendly facility. In total, 22,000 square metres of flooring have been installed. 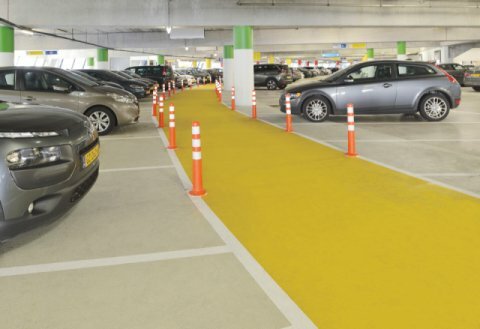 As a specialist in parking applications, Bolidt has developed a range of hard-wearing synthetic floor finishes tailored to meet the specific requirements of each area. For the cycling lanes, Bolidt recommended a non-slip finish to enhance cyclist safety. 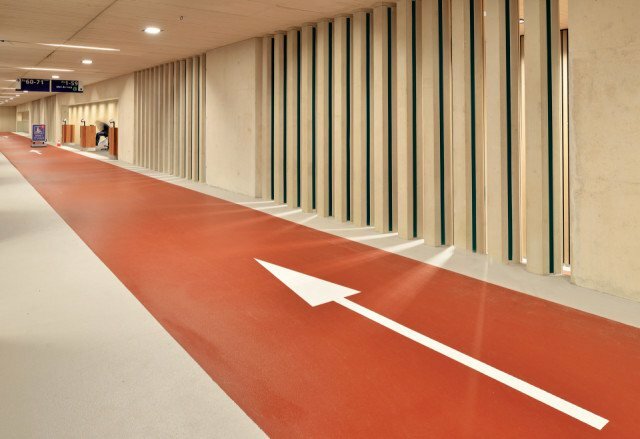 The Boligrip® flooring system was chosen for its non-slip qualities, providing safety for both pedestrians and cyclists. 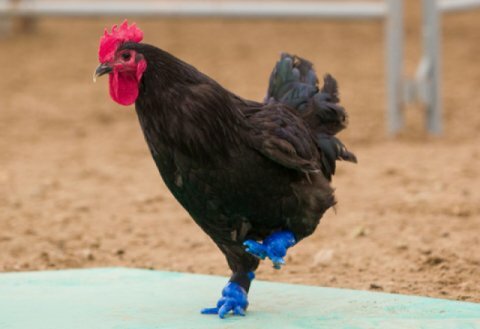 However, safety is not only about slip resistance. With so many cyclists in one facility, cycle and pedestrian routes need to be clearly signed and segregated. 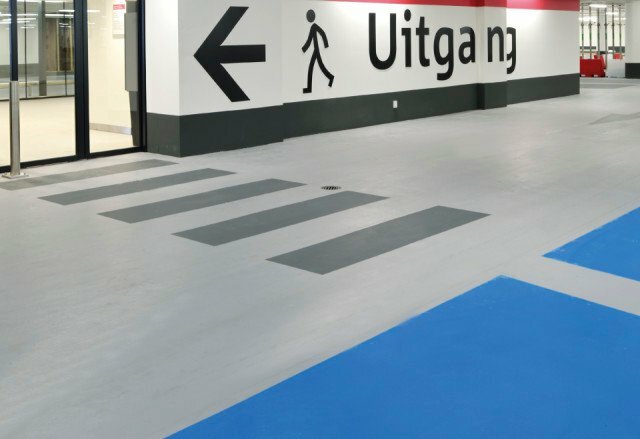 The Boligrip® flooring systems allowed architect Ector Hoogstad to choose from a wide range of colours. Not only do the colours create an atmosphere, but they also give clear distinctions between areas and provide a safe ‘road map’ for the users. Vredenburg P5 car park, located under Hoog Catharijne and Vredenburg square, is ultra modern. The building features a LED system that guides motorists to vacant spaces. As a parking facility it is truly unique, with a large display cabinet containing remnants of Vredenburg Castle. The underground facility is huge, with a capacity for 1,300 cars. 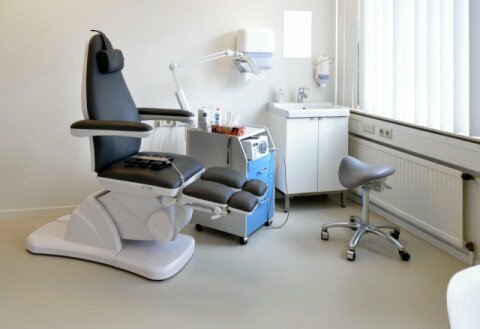 Bolidt was involved from an early stage to advise on the most appropriate type of flooring for each space. Boligrip® flooring systems were chosen for the most part, on the grounds of durability. 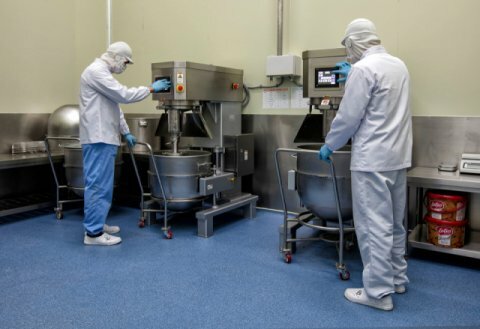 These extremely hard-wearing synthetic floor finishes offer triple functionality: they protect the concrete underneath, improve safety due to their slip resistance, and are highly customizable. The entry and exit points, however, were finished with Bolidtop® FiftyFifty, a system that offers a shimmering appearance that is aesthetically attractive. Thus, Bolidt’s unlimited perspective towards flooring solutions enhance the facility on every level; designers are allowed unprecedented freedom. The customer experience is essential to the success of any establishment. If approached correctly, it can leave a lasting impression. Hence, quality is always paramount. If you have any questions concerning Bolidt flooring systems and parking, please get in touch with Peter Staal.